VANCOUVER, Wash. -- Daylight hadn't poked its head above the eastern horizon, but yet there was a bustling crowd racing in all directions across the Lower Columbia River on a recent chilly spring morning. This wasn't the midweek morning rush hour of cars zipping across the I-5 Bridge, but a huge cluster of boats seeking out what could be the largest spring chinook return to the Columbia River since 1938. Fisheries managers are forecasting a whopping 550,000 spring chinook that are now heading back to the Columbia and its tributaries. For the past four years, I've made the trek south to get a chance at catching these prized fish known for their tasty, Omega 3-laced red-orange colored meat that rivals Alaska's Copper River chinook salmon. According to commercial fishermen who enjoyed some good catches this past week, these Columbia spring kings are a big seller to restaurants and seafood markets in the Seattle area. Biologist Joe Hymer and administrative assistant Wil Morrison at state Fish and Wildlife's Vancouver office dubbed me their unofficial good luck charm because on every trip the past four years we've caught at least two or more spring chinook. In the morning darkness we launched our boat at the Marine Park ramp in Vancouver, and planned to fish in the cleaner water above the Willamette River. Under the glow of flashlights we got our gear prepped, which consisted of a 6-ounce ball drop sinker attached to a spreader bar with a green or red Fish Flash with a 6-foot leader linked to two hooks with a chartreuse dyed cut-plug herring. Another added touch that the fish can't seem to resist is some type of scented attractant to coat the herring, and ours was Pautzke Nectar and Smelly Jelly paste. Our first few drifts in water 12 to 20 feet deep drew no fish to our herring, and the hordes of boats around us also seemed to come up empty-handed. Hymer kept in touch with friends downstream of us, and they too said it was slow. We kept our baits bouncing off the sandy bottom, and then after 8 a.m., we noticed some boats around us hooking into fish. "It looks like the bite is going to happen," Hymer and Morrison said in unison. Shortly thereafter, I watched as my pole tip vibrated as the sinker kept a gentle bounce on the sandy bottom, and then the tip made a distinct nose dive into the water that indicated our first fish was hooked. I grabbed it out of the pole holder and gently fought the fish as it made a few runs across the surface and then went straight under the boat. It didn't take long before I gently glided the fish into the awaiting net. We took a close look and found it was a 15 pound wild spring chinook, which you must release. Only healthy stocks of hatchery-marked fish, those with a missing adipose are allowed to be kept. Hymer jokingly thanked me for beating the odds of catching a wild fish, since about 85 percent of the fish seen in this fishery are of hatchery origin. We quickly moved upstream of where we released the fish, and saw more boats hooked up with fish. "The bite is on," said Hymer as we neared tide change, which usually produces the best action. About halfway down the drift, it was Hymer's turn as his rod jerked down, and line started to peel off his reel. After a brief battle, Morrison got the net under a hatchery fish that weighed 16 pounds. I felt the odds of getting another chance were running slim as the clock ticked to 9 a.m. But, as luck would have it on the next troll, I put my rod in the holder and a few minutes later I hooked my second fish. This like the other one made some runs away from the boat as we chased it around the big river, and after a few tries we landed the 13 pound hatchery king. Then the bite faded as quickly as the sun rose high over the horizon in between the cloud banks. We kept trying to get that one last fish as afternoon approached, but it was to no avail although we knew there would be many days ahead to get more chances. Fisheries managers set the spring chinook forecast conservatively as predicting returns in recent years has been over predicted. With that said biologists are still optimistic there will be a very good run this spring, and it appears to be a late-timed return of fish. Hymer says angler effort was off the charts and catches this week below I-5 were very good, and even better since we had fished it. An aerial survey taken Wednesday showed 900 boats between Sauvie Island and I-5, which represented about 75 percent of all boats counted in the lower river. The Columbia spring chinook fishery is a big economic boost for Washington and Oregon businesses. Through April 4, 90,600 angler trips were made below Bonneville with an estimated 11,100 fish caught (9,600 were kept). The effort last month alone drew 63,400 angler trips and was the highest since 2003 (65,800), and the catch of 6,800 fish was the highest since 1990 (9,000). Where/when: The Columbia from Buoy 10 to I-5 is open daily through April 18, but could close earlier if the allowable sport catch is reached. Fisheries officials are meeting early this week to make a determination. Areas from I-5 up to Bonneville are closed to fishing. Areas from above Bonneville to McNary Dam are open daily through May 31. Bank fishing only from Bonneville to the Tower Island power lines located six miles below The Dalles Dam. Fisheries managers will meet each week to get a run size update, and it is likely that a decision to reopen the Lower Columbia might not occur until early May. Allowed: Daily limit is one hatchery-marked spring chinook daily below I-5, and two daily above Bonneville. Not allowed: Anglers must release wild spring chinook. Only hatchery fish with a missing adipose fin may be kept, which is the small fin near the tail. Elsewhere: The Willamette River has been good for spring chinook, although the water is pretty muddy and flowing pretty swift through Portland. The forecast is 62,700 fish compared to last year's run that was the fourth worst since the early 1970s. Catches picked up in the Cowlitz where 12,500 springers are expected, and is three times larger than last year's forecast. Same goes for the Kalama although only 900 fish are expected to return. The Lewis is expecting 6,000 fish, and that's 20 percent above the 10-year average. 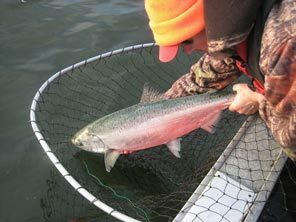 Areas above Bonneville Dam currently open for spring chinook are the Wind River and Drano Lake where strong runs are expected, but don't expect those to blossom until May or when fish counts surge at Bonneville. The Drano forecast is 28,900 and is the largest forecast in the past 40 years. The Wind forecast of 14,000 is the largest in seven years, and the Klickitat forecast of 4,500 is the biggest in more than 30 years. Areas below McNary Dam also generate decent springer action, and anglers can time fishing it by watching the dam fish counts. The Columbia above McNary Dam, and the Icicle, Yakima, and the Lower Snake River all the way up to the Clearwater River in Idaho are also expected to give up some good fishing. Specific seasons in those areas will be announced soon.